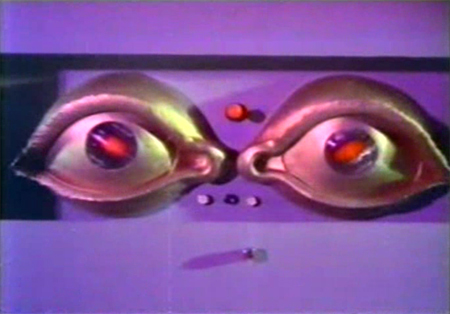 I quickly grew tired of the plot (Pran evil, Mumtaz helpless, Jeetendra clueless, I.S. 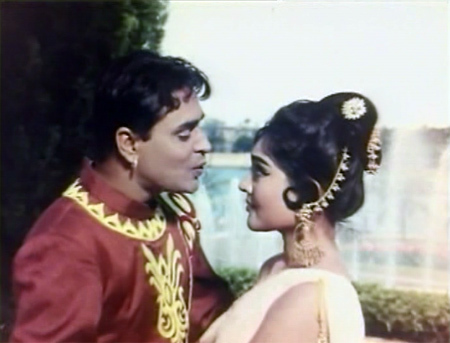 Johar painful), but remained riveted to Mumtaz’s Disney princess wardrobe and accessories. 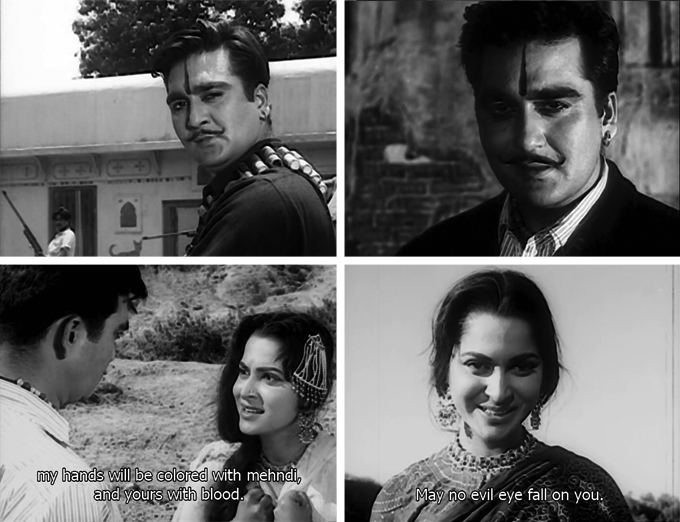 I’ve said it before and I’m likely to say it again: I love Sunil Dutt as a dacoit. He is just so perfectly suited to the black tilak, the mouche, the gold hoop earrings, the manly bullets slung around his tall form. Fans of Mumtaz now have another compelling reason to live! I am so pleased to announce the arrival of a new Tom Daniel dvd compilation (be sure to read the attached pdf file for links to his previous dvds if you haven’t gotten hold of them yet). This is Part 1 of a three part series chronicling Mumtaz’s career, and contains 23 songs from her early years up through 1966. She truly deserves this kind of tribute to the formidable talent, charm and hard work that made her justifiably famous. How much do I adore this film? Let me count the ways! 1) Dharmendra; 2) Mumtaz; 3) everybody else in it—wah! what a cast; 4) the gorgeous songs; 5) the fine ultra-masala plot; 6) Dharmendra’s chaddies; 7) the props and sets, including my new obsession the Egyptian Room; 8) the best use of Indian Movie Balloons and (possibly) Padma Khanna EVER; 9) Mumtaz’s outfits and Spare Hair; 10) no Comic Side Plot to speak of; 11) wooden gora extras; and 12) everything else I haven’t mentioned. Everything. 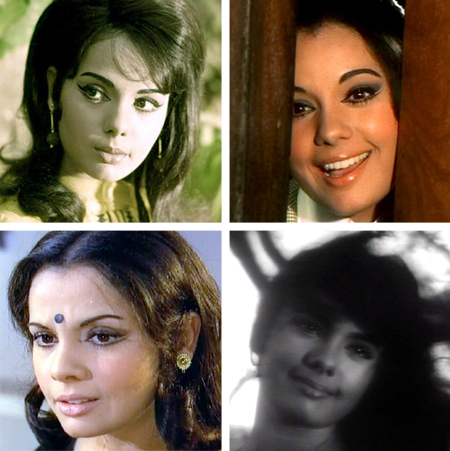 Mumtaz simply cannot be contained in a list of ten songs only: she had the good fortune to work in an era—and in films—with such great music, that I just find it impossible. Not only that, but because she was often the heroine (first mostly in so-called B-movies of the sixties, then as an A-list star in the seventies) she usually had three or four songs per film, unlike women who were confined mostly to dances or small supporting roles. Needing to recover from the horror that was Hawas, I felt that a little bit of gentleman Dara Singh might go a long way towards soothing my ruffled feelings. Sadly, not much Dara is available with subtitles, but I figured the eye-candy inherent in a sword-and-sandals picture featuring also a young Feroz Khan, Ameeta and Mumtaz would doubtless be enough. And it is! 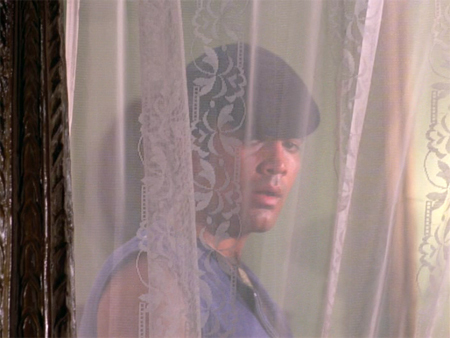 Truly I have no idea what actually goes on in this film. 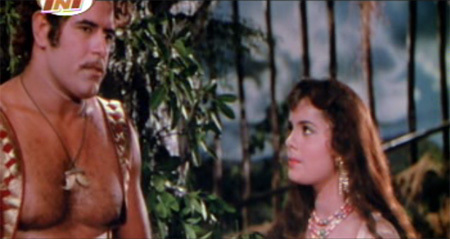 The plot details escape me, but I can tell you that in true Dara Singh fashion, Samson is not only a strong-man Biblical type wearing a skirt and gladiator sandals, but also a Tarzan friend-of-elephants type, and he and Mumtaz share the best romantic chemistry I’ve seen yet in a Dara epic. I can only imagine that director Kamal Sharma was left a small legacy by his grandmother or someone, and jumped at the opportunity to make the film he’d been dreaming of since he saw his first Bond movie: “I have IDEAS! Many of them stolen, almost all of them bad, but I won’t let that stop me!” Most of his tiny budget went into helicopters and probably Helen, with nothing left over for an actual script or any production values. The lack of subtitles is even almost welcome, since the chaos onscreen is such a bombardment to the senses that having to read too would have made my head explode. In any case, I can say with certainty that I have no clue what happens, except that several different gangs of people are all vying to grab a “formoola” for some sort of bomb for which the dastardly “Chinese” are willing to pay a premium price. If you are in the mood for a cleverly plotted swashbuckler a la mode indienne, reach for this one. The dialogues are written by Abrar Alvi, always a good sign, and the screenplay by Javar Sitaraman; the story is intricate, entertaining and witty. If Rajendra Kumar and Ajit are a *little* too old to be playing men in their twenties, it doesn’t really matter and they look just fine opposite Vijayanthimala. She is beautiful, even sharing lots of scenes with the younger and equally gorgeous Mumtaz, and she shows us all once again that GIRL CAN DANCE. Amazing. Shankar Jaikishan’s music is catchy and pretty, and the host of supporting character actors all seem to be having fun—Jagirdar especially, as the dacoit Ram Singh. Plus, a loyal horse and clever elephant companions: what’s not to love, really?